Absolutely extraordinary-looking: long-nosed, armour-plated, big-eared, the armadillo is one of nature’s comedy animals, related to those others, the anteater and the sloth. 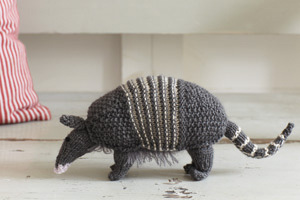 The armadillo comes in numerous varieties from the tiny (chipmunk-sized) pink fairy, to the pig-sized giant. King George II was presented with a pet armadillo, which he kept alive on a diet of hard-boiled eggs. Flanders and Swann, the popular 1950s double act, sang a heartbreaking song called ‘The Armadillo’, set on Salisbury Plain; it tells of a misguided armadillo singing a love song to an armour-plated tank.